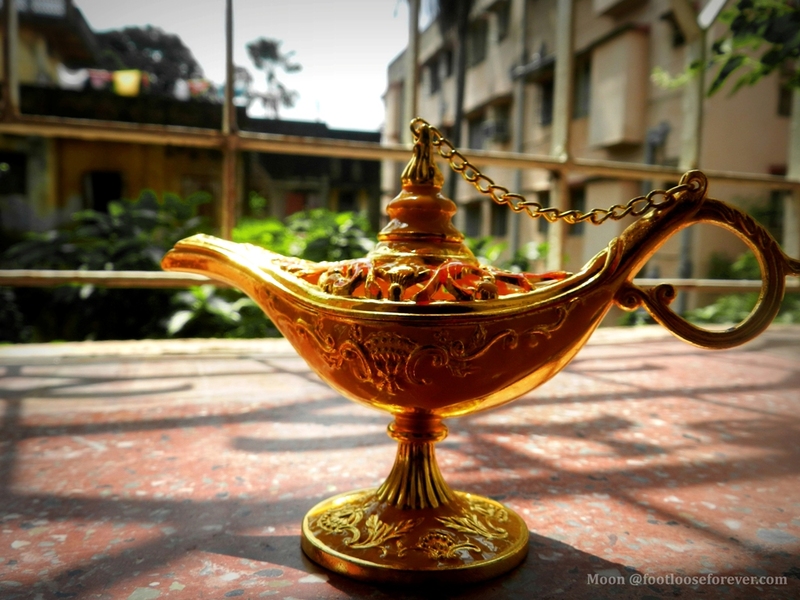 The song from my favorite Hindi movie Jab We Met was buzzing in my ears. With winding hilly road as far as eyes can see, pines and cedars lining the road and sunshine on my shoulder (especially after two days of incessant rain) what else I could think of! It was a pleasant, sunny morning. 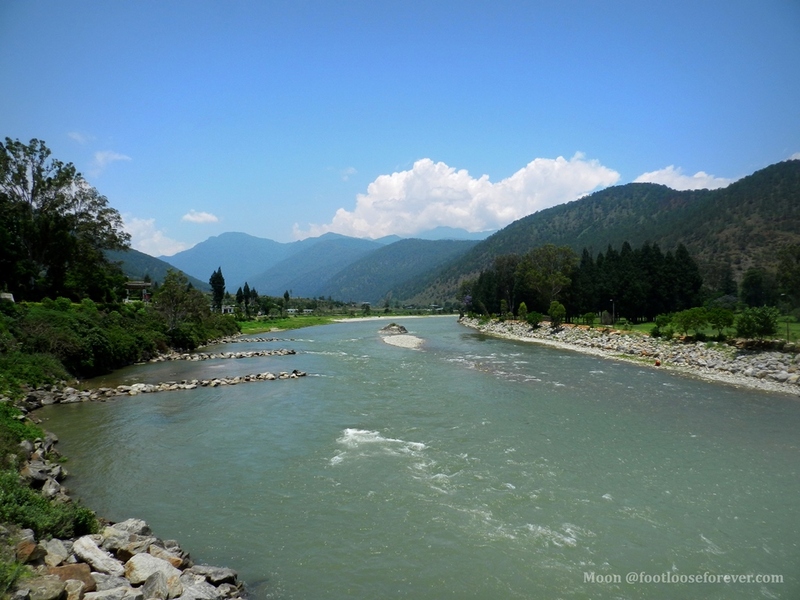 We were headed for Almora after spending the last night in Choukori. Luckily, I could manage the front seat right in the driver’s cabin to enjoy the journey to the fullest. 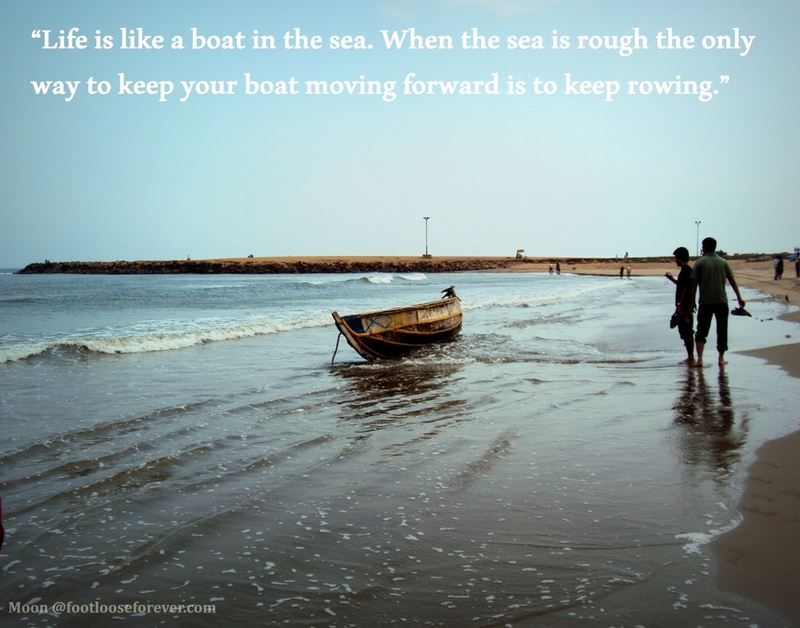 Sometimes the journey seems better than the destination. Nevertheless, Angan Resort in Choukori was a beautiful place to stay. There were groves and bushes all around. The garden was in full bloom with cosmos, marigolds and dahlias. The green slopes dotted with cottages created wonderful vista in the soft sunlight. But the ultimate joy was yet to come. As the morning grew older the mist dissolved and the sky became clearer. 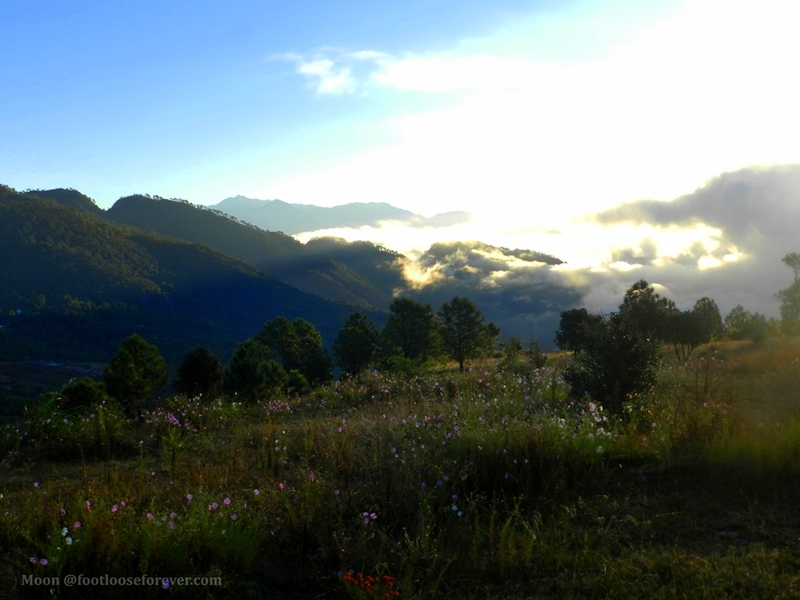 The Himalayan peaks – Nandakot, Panchulli, Trishul – all were shining bright in the daylight. 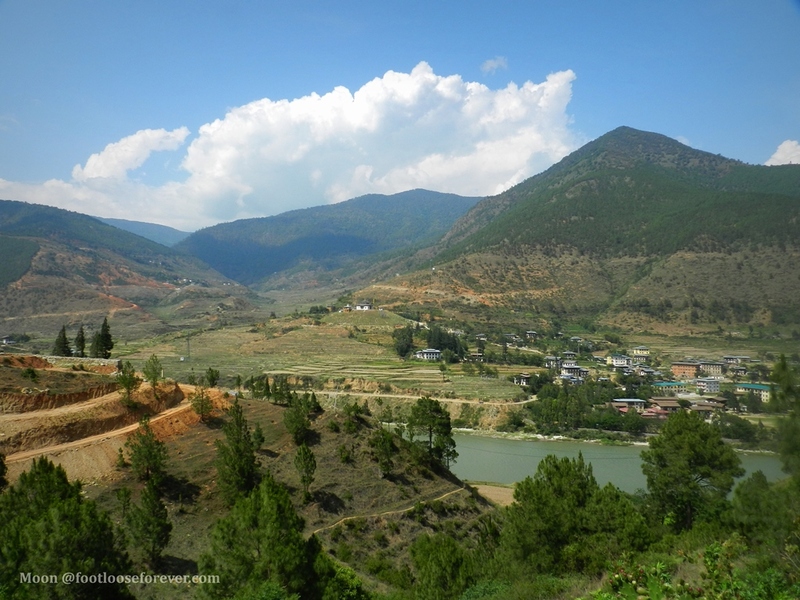 It seemed that the pastures, the hills and the resort – the entire place was surrounded by an array of snow-capped peaks. It was AMAZING! Just one day ago it was really difficult to imagine a sunny day like this. Weather changes so fast! 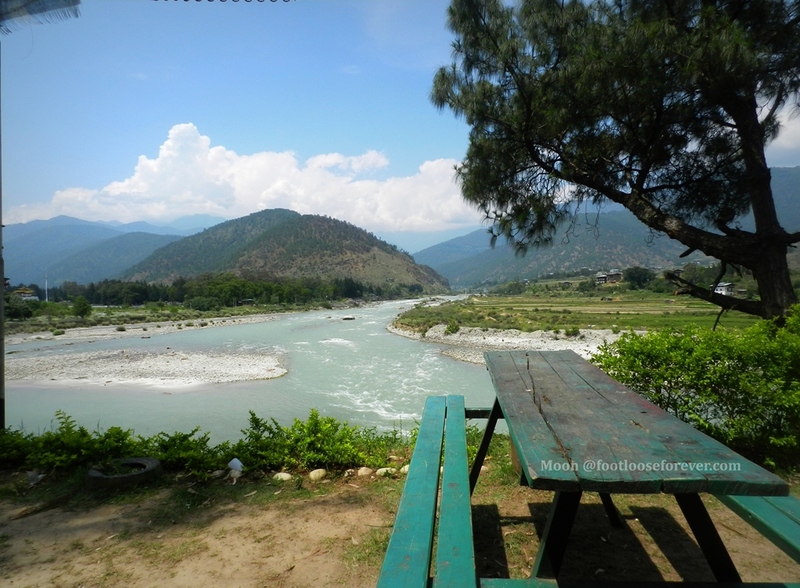 The previous day, Kausani to Choukori has been a long journey via Gandhi Ashram, Baijnath Temple and Bageshwar where the rivers Gomati and Sarayu meet. Gandhi Ashram also called Anasakti Ashram (‘Anasakti’ refers to the spiritual state of selflessness and non-attachment from materialistic pleasure) where Mahatma Gandhi wrote ‘Anasakti Yoga’ (The Gospel of Selfless Action). The ashram has a museum displaying some of the rare photographs of the Mahatma in various stages of his personal and political life. Baijnath Temple is a millennia old temple dedicated to Lord Shiva (Vaidyanath, hence the name Baijnath). It is now an archeological site. 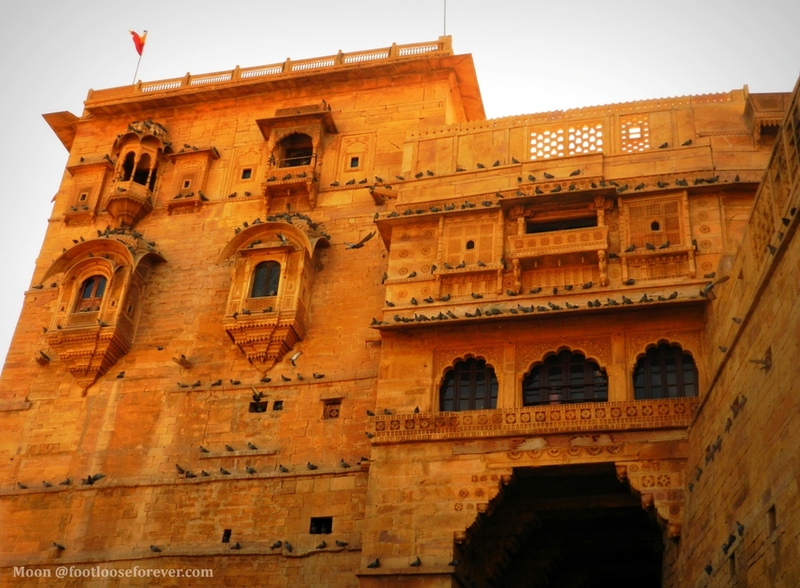 Built in 1204 A.D. this temple is one of the oldest continuously worshipped temples in the country. 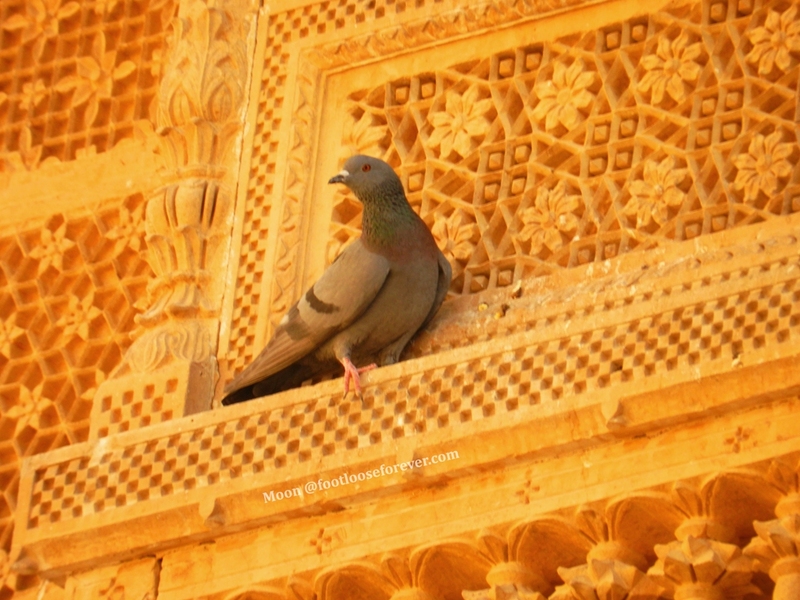 Still standing strong the temple is a silent witness of the River Gomati’s journey for over thousands of years. 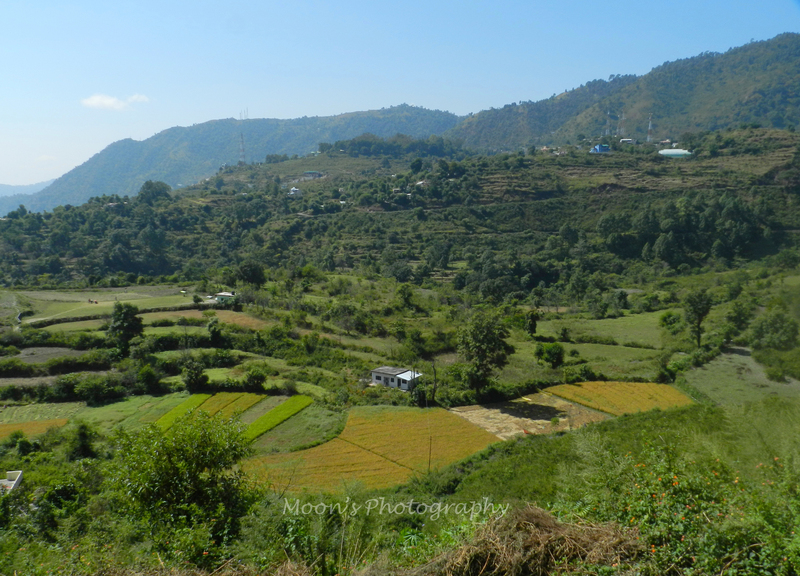 Coming back to where we started … we left Choukori for Almora at 9:30 in the morning. Hotel Shikhar was our immediate destination in Almora. Our stay in this moderate budget hotel was really enjoyable. Its strategic location allows easy access to the bustling town center and market. You can also spend hours sitting on the terrace watching at the Himalayas and soak in the scenic beauty of Kumaon hills. The next morning was scheduled for Almora sightseeing. Our first stop was Ramkrishna Kutir, a small monastery operated by the Belur Math. 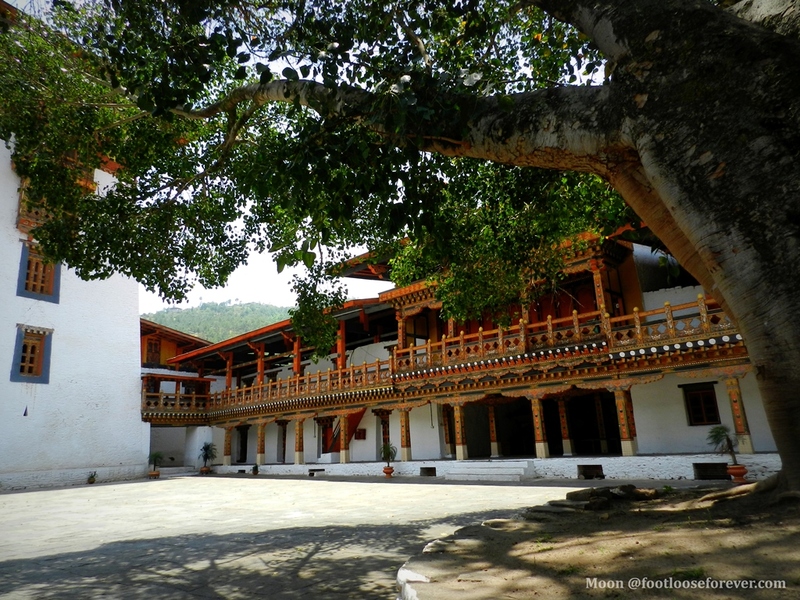 The monastery, nestled in the lap of the mountain, offers a peaceful resort for prayer and meditation for everyone in search of peace and salvation. 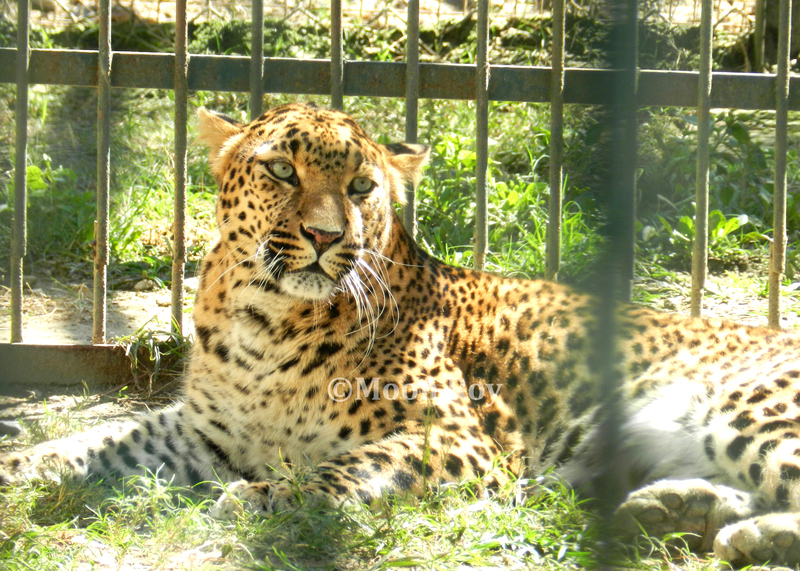 The star attraction of Almora Zoo is definitely leopards. These leopards are found in the jungles of Kumaon Himalayas and they are the protagonist of the book Man-Eaters of Kumaon by the famous naturalist-hunter Edward James Corbett, popularly known as Jim Corbett in Northern India. After completing our sightseeing in Almora we returned to the hotel. We had to pack our bags for the next leg of our trip which was from Almora to Lucknow by 13020 Bagh Express which departs from Kathgodam at 9:55 at night. 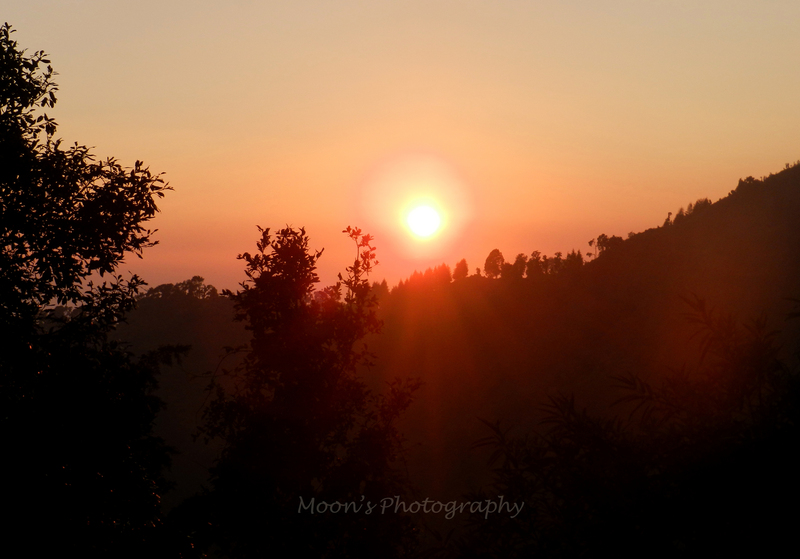 Finally, the day came… we were about to leave Nainital for Kausani. I woke up very early, at 5:30 that morning. Put on my hoodie and got out of the hotel room to take a look at the lake, and the promenade, and the buildings all around for one last time. The sky was still dark; the lake was still plunged into darkness; the streetlights were still on and some fitness freaks were seen jogging up and down the Mall Road. 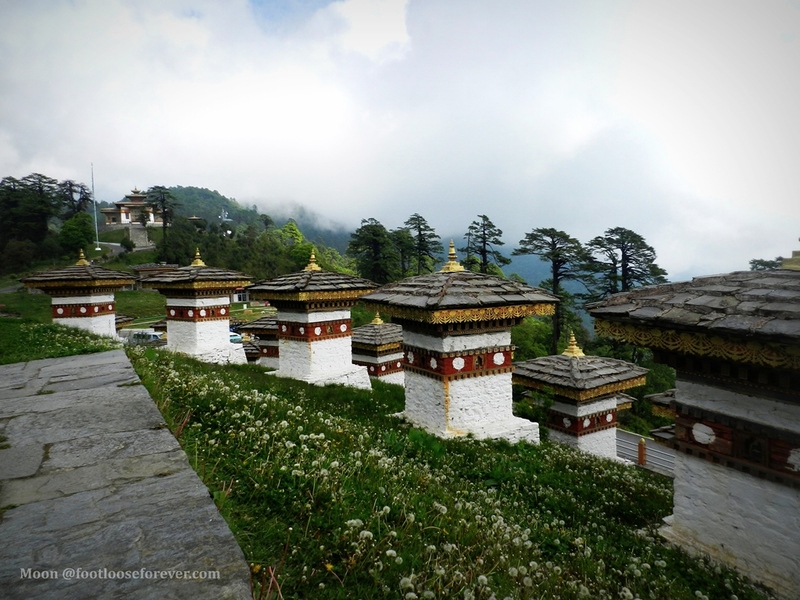 Suddenly, the temple bell (Naina Devi Temple) started ringing – ting-ling-ting-ling – piercing the silence of the dawn. 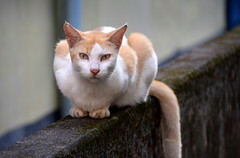 That moment, standing alone on the balcony, I felt a pang in my heart. 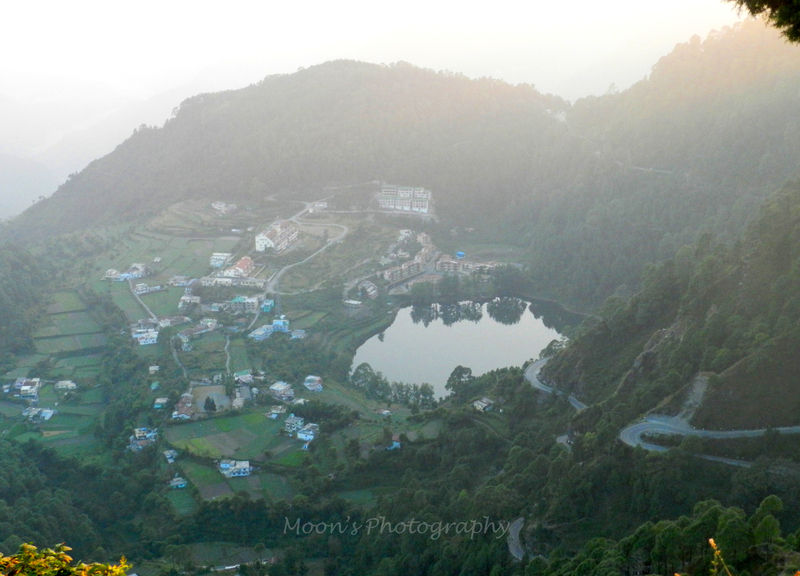 The pang of separation from my beloved Nainital. We started for Kausani at around 8:30 that morning. The sky was dull and gloomy and the drizzle started. It seemed that Nature reflected my mood at that moment! 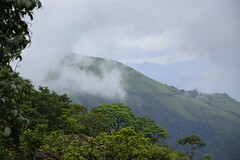 As we proceeded with our journey the drizzle continued giving a hint of the inevitable downpour later. 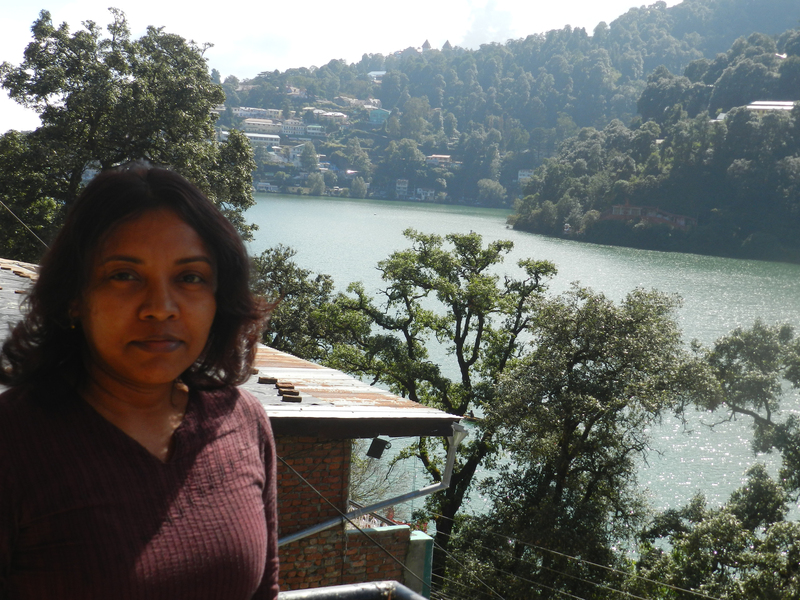 After two sunny days in Nainital the rain was a sheer disappointment. A thin layer of fog limited our vision. We sat inside the bus with all windows tightly shut, and cursed the unexpected rain silently. I was vaguely looking at the rain-washed road and trees along the slopes of the hills when I suddenly realized that the view outside was quite interesting. It was different but beautiful. This realization wiped away all the bitterness and filled my mind with joy and hope, once again. “Nature never did betray The heart that loved her”… She always compensates one way or the other. 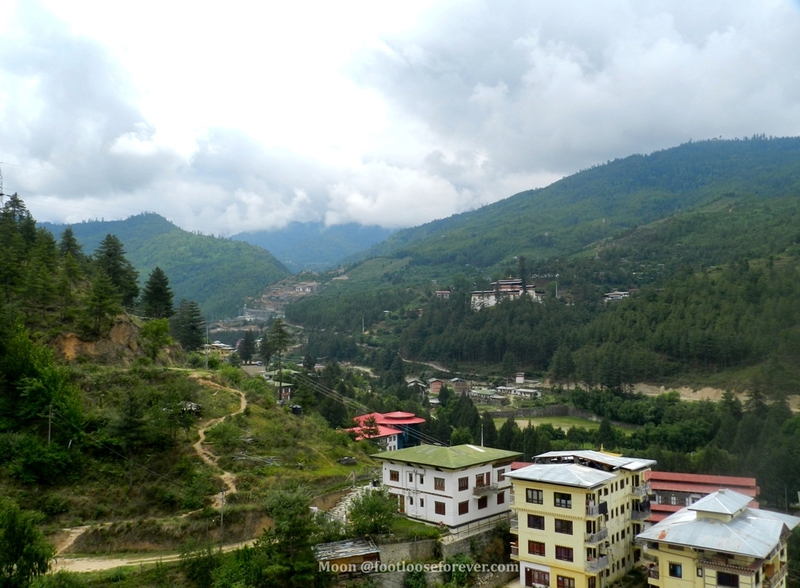 I caught a few glimpses of the hills and towns bathed in late monsoon rain. On our way to Kausani via Ranikhet our first stop was Kalika Mandir, an old temple nestled on top of the hill overlooking the green slopes. Then we halted at Ranikhet Golf Course in the Army Cantonment area and spent some time there. Rain could no longer spoil my spirit neither the excitement of stepping on a golf ground for the first time in my life. The Army Golf Course at Ranikhet is a wide-open space soaked in quietness. I think the combination of rain and fog made the atmosphere even more dramatic. 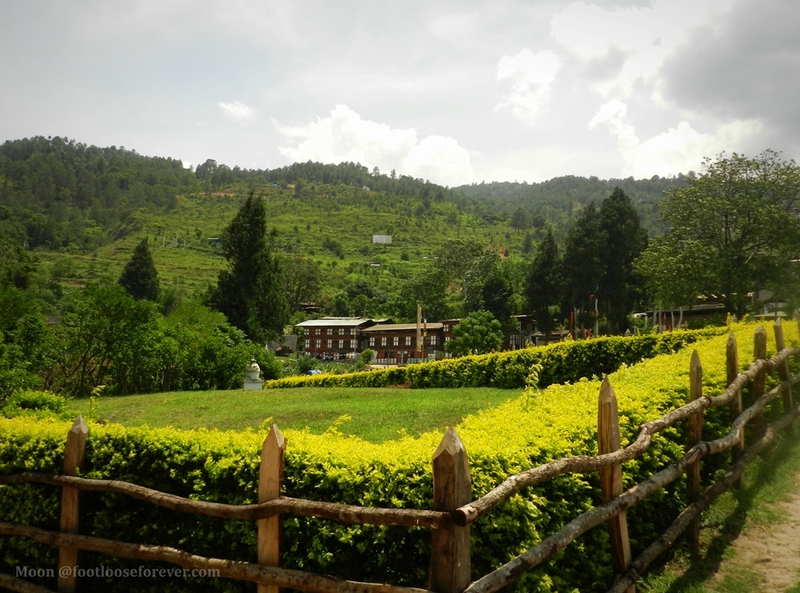 The sprawling green field with varying elevations and towering pines lining the boundary is altogether a treat to the eye. The pitch-black highway runs through the green field and finally disappears into the mist. The highway runs through the green field and finally disappears into the mist. I wanted to run like a kid but didn’t dare, as the ground had already turned slippery from continuous rain since morning. 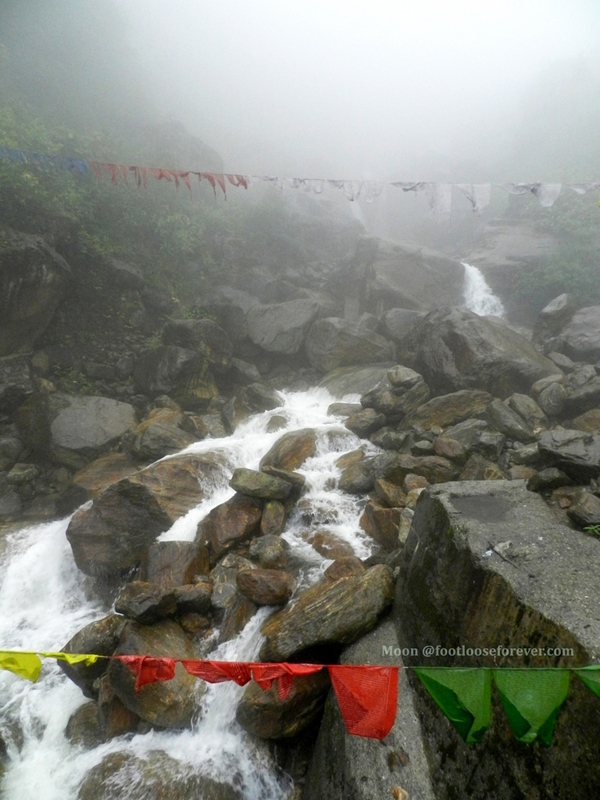 I have been on the hills in monsoon when we made our trip to Namchi, Sikkim. So, I have seen it raining on the hills. But in Ranikhet and all the way to Kausani it was more pleasant an experience than it was in Namchi. It was almost 5 pm when we reached our hotel in Kausani. I switched on the TV in my room while leisurely sipping my coffee. The news report said that this untimely downpour was the side effect of cyclone Hudhud that left my favorite port city Vizag in utter destruction. My heart sank at the scenes of devastations that were showing on the news channel. 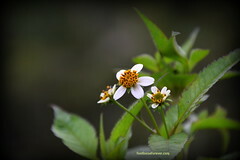 My memories are still fresh with beautiful pictures of from our trip to Vizag back in 2010. We stayed at Himalayan Mount View Resort in Kausani from where you can expect breathtaking views of snow-clad Panchchuli peaks of the Himalayas. Since it rained all night I gave up all hope of any scenic view next morning. When I got up at 6:30 next morning rain had stopped but there was no sign of the sun god. 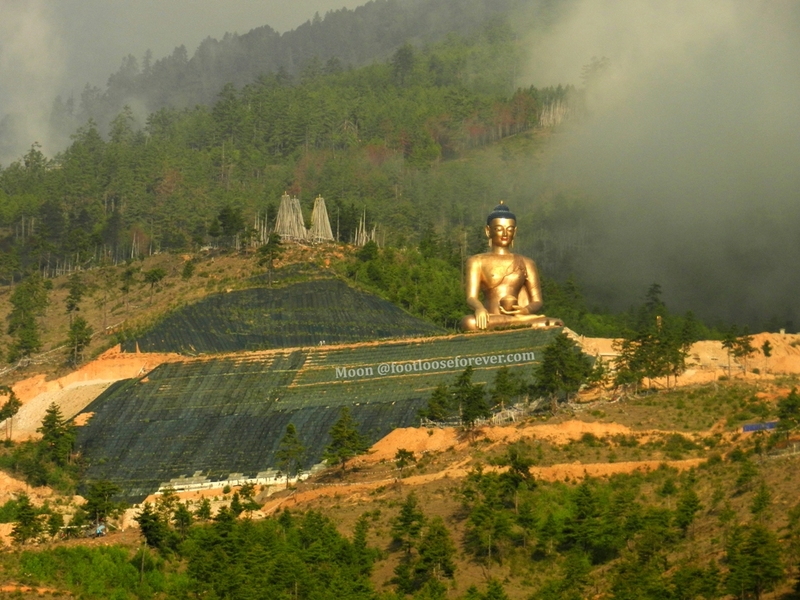 A veil of mist covered the hills and blotted out the peaks from our vision. As the morning grew older (it seemed) the mist got heavier and hovered down the slopes of the mountain offering an obscure view of the surrounding. A veil of mist covered the mountains. I always have a penchant for hill stations. The Himalayan Mountains with their magnificent snow-capped peaks and green pastures, standing tall in silence always attract me. 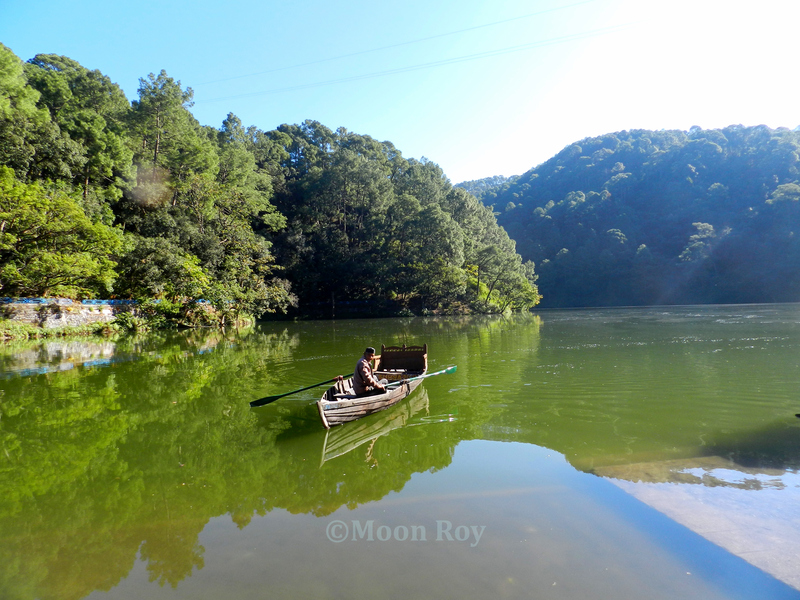 So… when I got the proposal for a trip to Nainital I readily accepted it. The magical charm of lakes was bonus with the beauty of mountains. 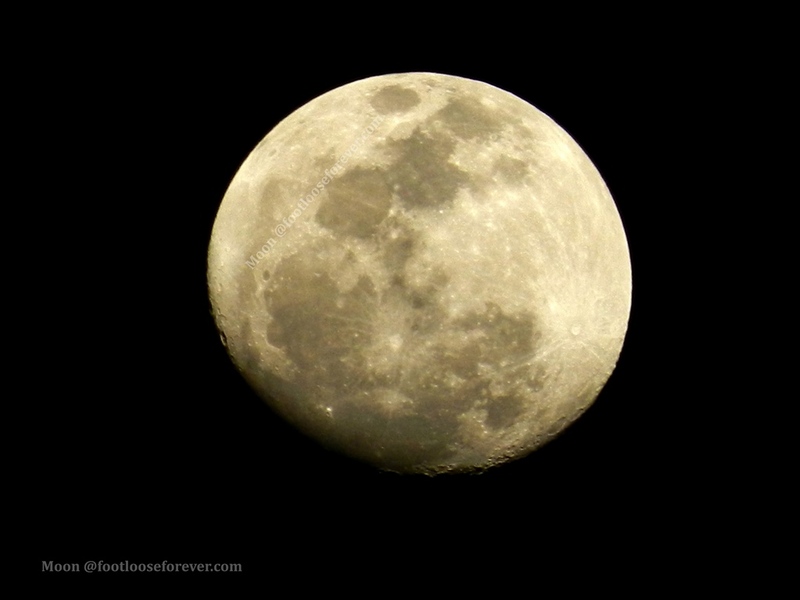 And now, when I am writing this post I feel happy about the decision I made in haste. Nainital, the City of Lakes at the heart of Kumaon Himalayas in Uttarakhand is one of the most beautiful hill stations in India. 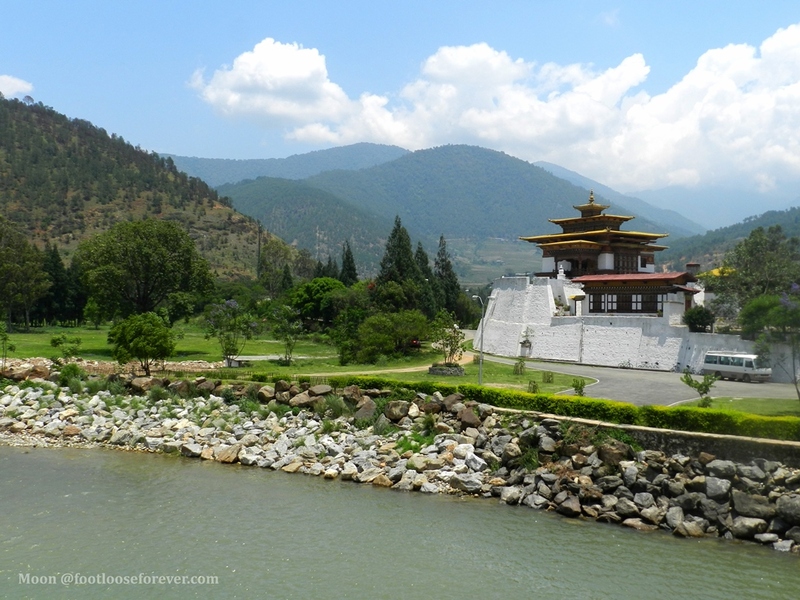 The scenic landscapes dotted with emerald-green lakes surrounded by mountains and pleasant weather almost year-round attracts tourists from all across the country. 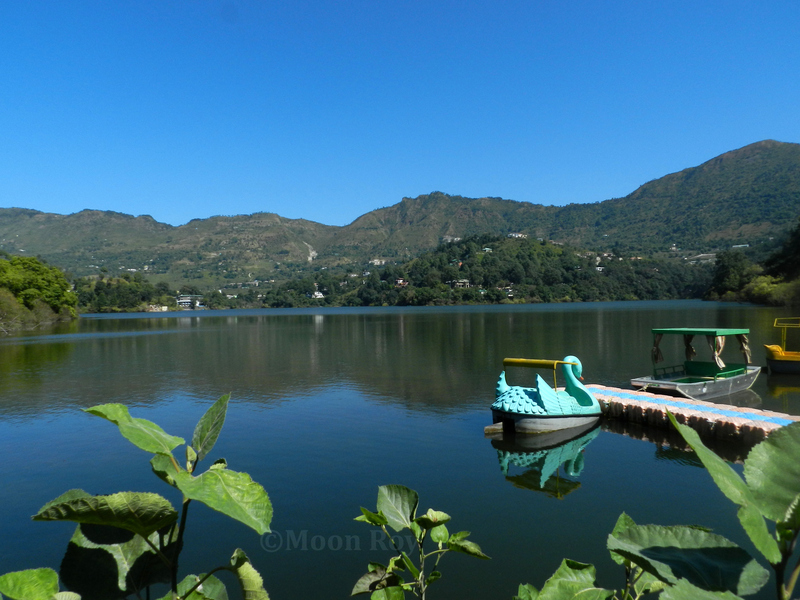 Nainital district, also popularly called as the ‘Lake District of India’, consists of several naturally created freshwater lakes and mountains. Tal means ‘lake’ in local language. They say there were more than 50 such lakes most of which now have disappeared. The effect of human civilization! Sometimes the thought of ‘how fast we are losing our forests and natural resources’ dreads me. 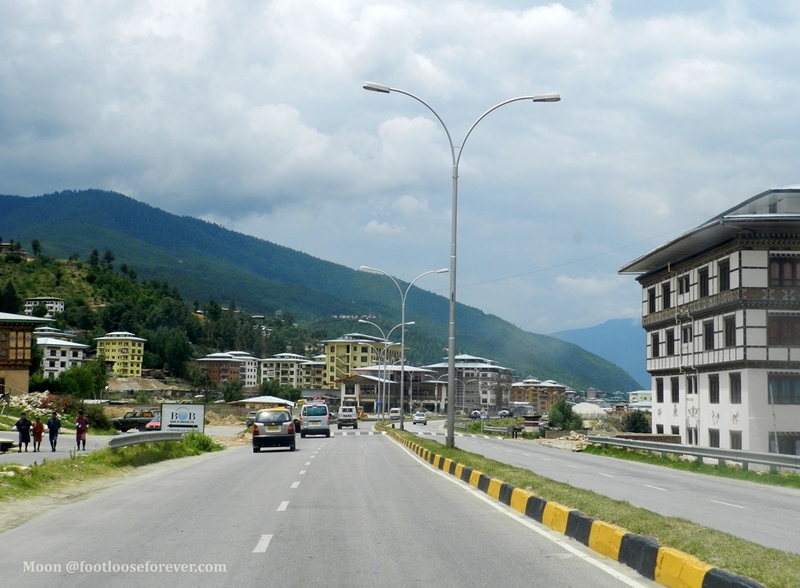 We stayed in Hotel Shalimar, a budget hotel with a strategic location ensuring quick access to the town’s mall as well as spacious rooms overlooking the Naini Lake. The boat pier was visible right from the hotel’s veranda. But if you are looking for a luxurious accommodation there is Grand Hotel on the Mall Road to offer you magnificent view along with high-quality service. . However, these are examples only. Hotels are aplenty in Nainital. We reached the hotel at around 1 pm and took a much-needed shower and had lunch. After that we set out to explore the town. 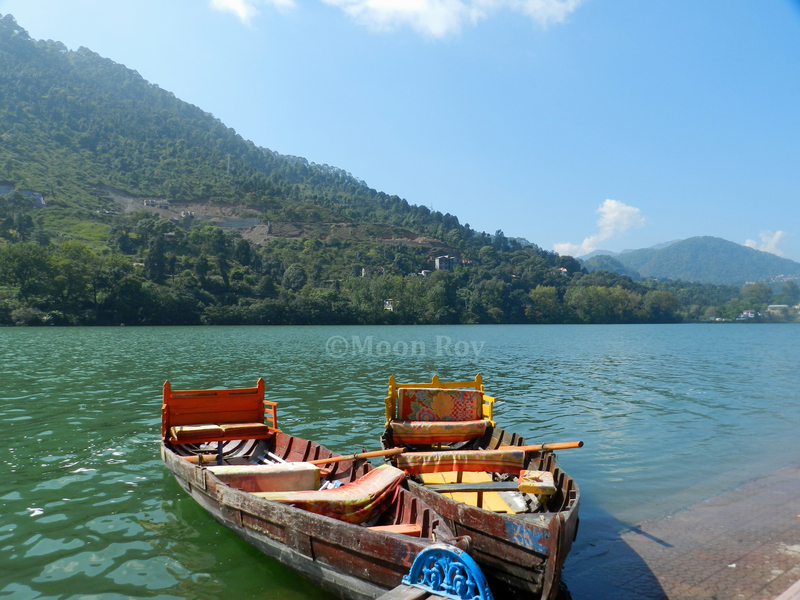 You will find two types of boats in Nainital for recreational purposes – paddleboats and rowing boats. 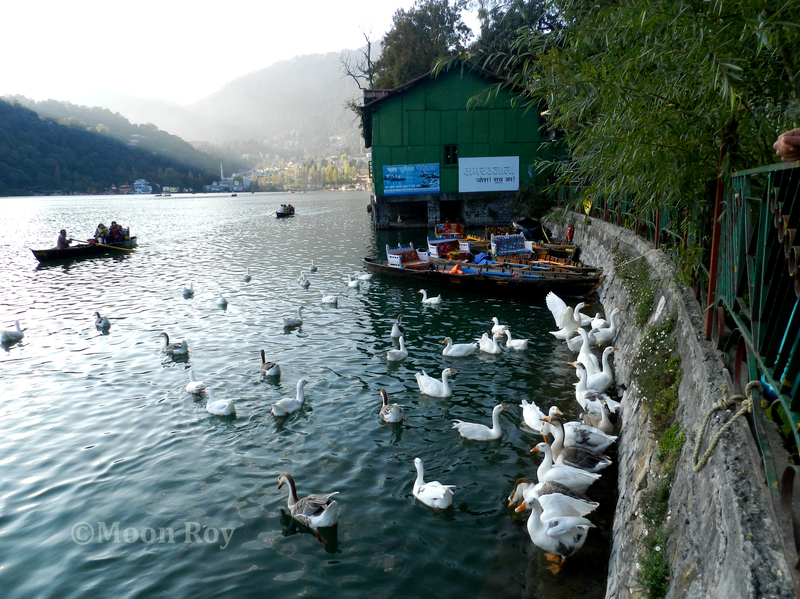 The view of white swan-shaped paddleboats lining up the wharf at Naini Lake was simply inviting. However, we finally went for a rowing boat since it can accommodate up to four people at a time excluding the boatman. Charge is Rs 210 per boat for a 30-minute ride. 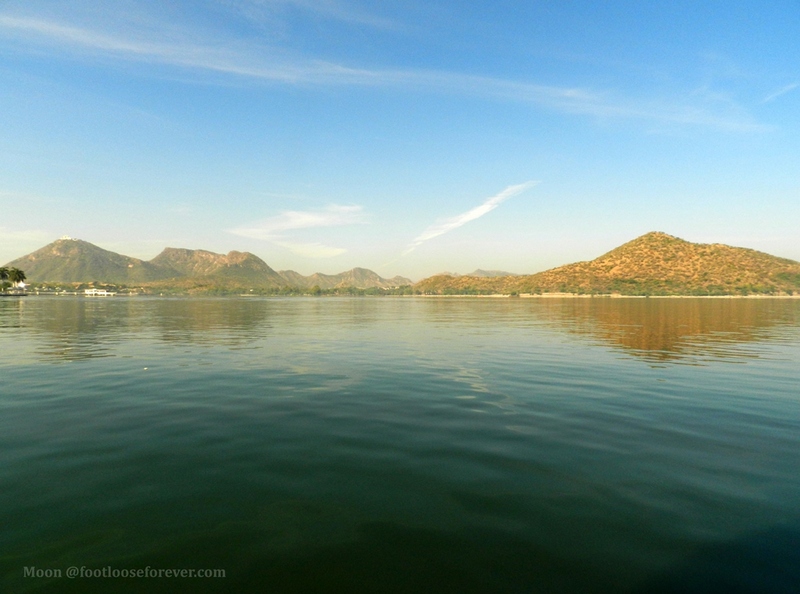 As we were enjoying the ride on the pristine water I looked at the promenade along the lake. It was lined with maple trees. There yellowing leaves were looking fiery in golden streaks of afternoon sun. 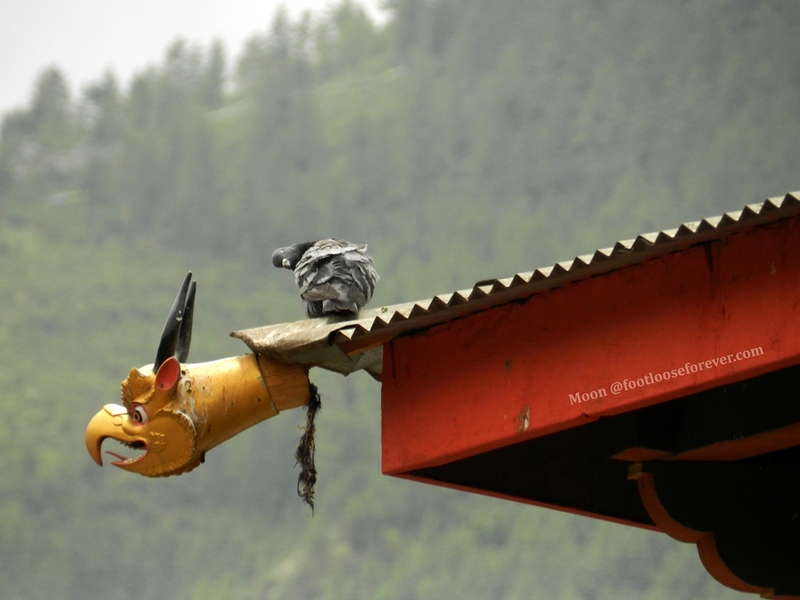 From my experience I think this is the first and foremost thing to do when you are in Nainital town. 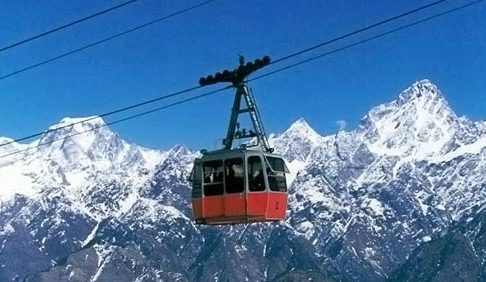 The ropeway or the cable car takes you to the Snow-View Point situated at a height 2270 meter from where you’ll not only get a panoramic view of Naini Lake but also a breathtaking view of the snow-capped peaks far away. One ride (to and from) costs Rs 150 per head for adults and Rs 100 for kids. The board on the counter says the timing to buy tickets is from 10 a.m. to 4:30 p.m. But when we reached there by 4 p.m. the counter was already closed. The ropeway is operated by the government. As we inquired we were told that there is a quota for daily tickets. As soon as the quota for the day is full the authority closes the booking counter. Unfortunately, that was the thing happened with us. We had to return disappointed because we did not have the time to go back the next day. Sightseeing in Nainital mainly includes visits to Bhimtal, Sattal, Naukuchia Tal, Nainital Zoo, Waterfall, Sunset point and Khurpatal. 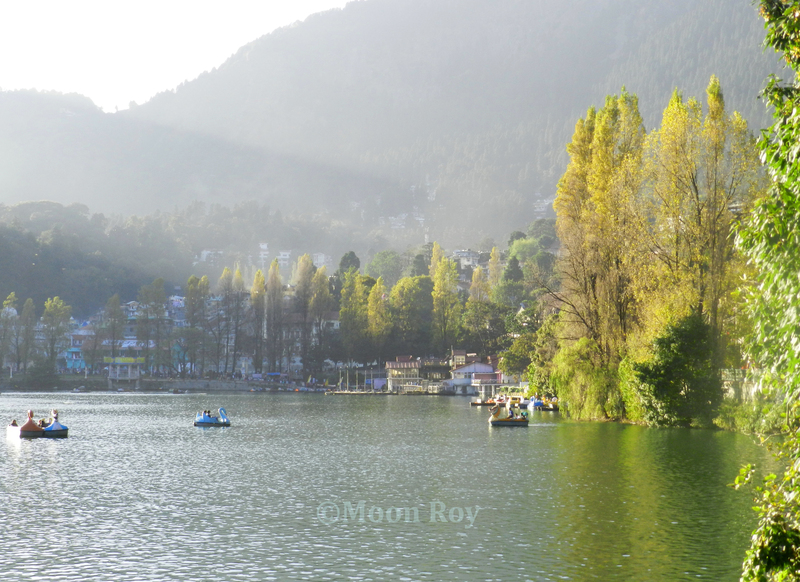 Bhimtal is situated at a lower altitude than Naini Lake. The aqua blue water beckons onlooker to have a boat ride or at least spend some time by the waterfront. Fish lovers may like to see the aquarium situated in the middle of the lake. Although the tickets for boating and aquarium are separate you have to collect them together from the waterfront office in case you wish to find out what’s in store at the aquarium. It was a bright sunny day and we thoroughly enjoyed boating under the sun. 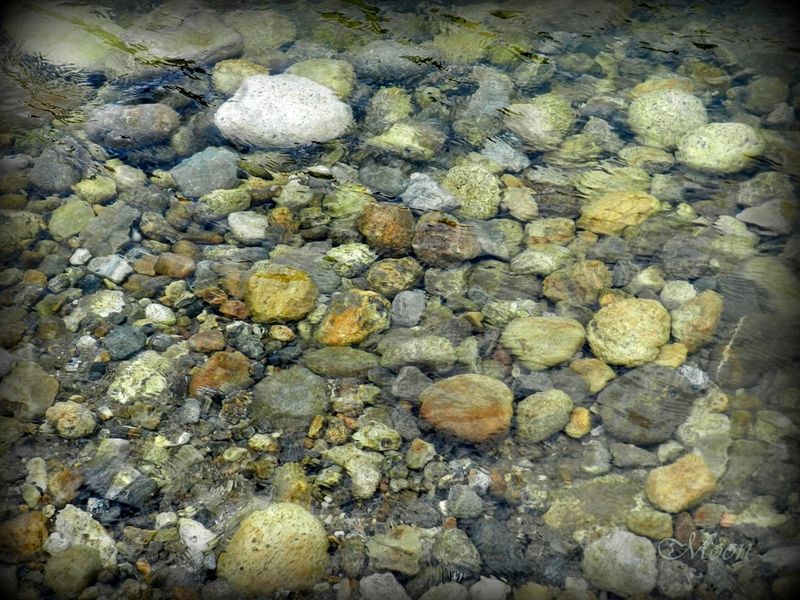 The smell of fresh water brought by the cool breeze rejuvenated my soul. 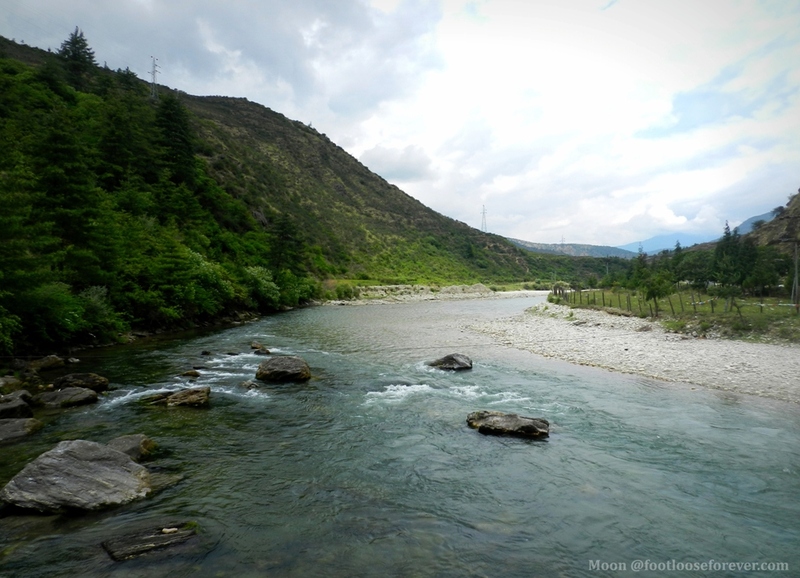 It was the serenity of the place that I liked the most. 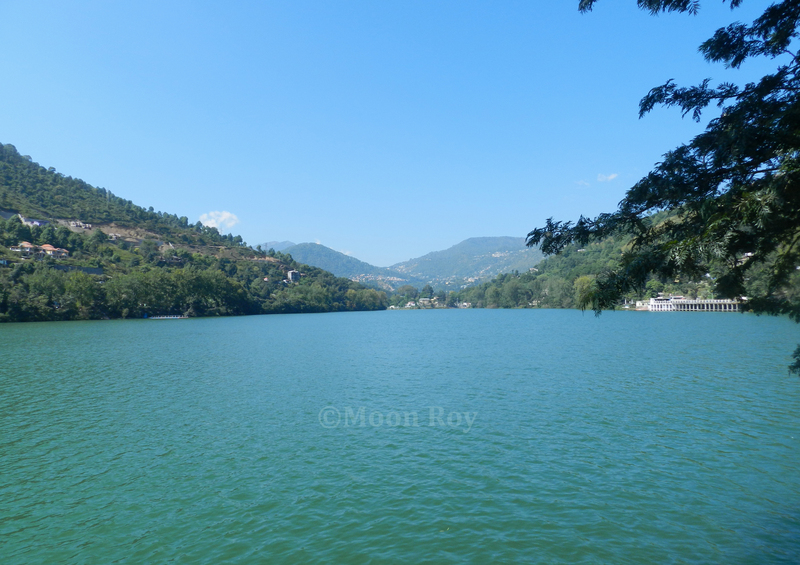 Sattal is a combination of three lakes joined together naturally. Apart from boating facility there is one more attraction. 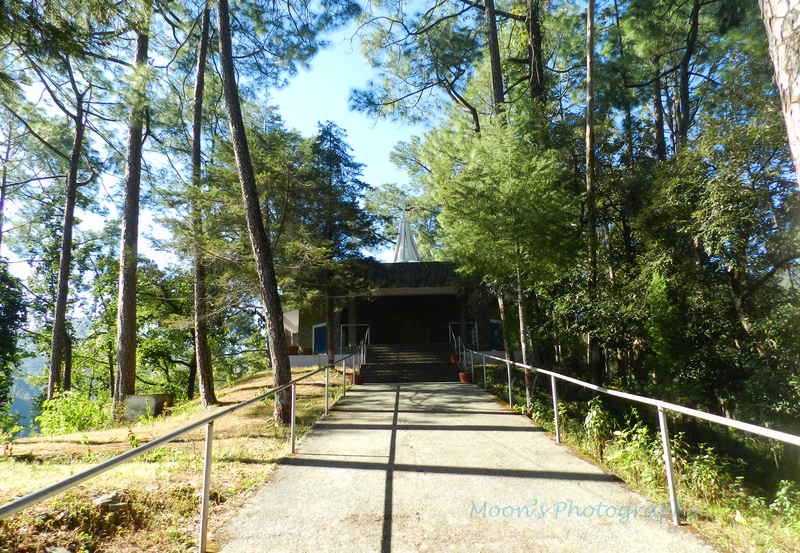 It offers a 15-minute trek to the church on top of the hill on the other side of the lake. I enjoyed trekking along the narrow, steep walking trail with giant pines and other coniferous trees creating a canopy over my head. The trail ends in front of a Church. I sat down in front of the closed door of the church and tried to feel the silence and sanctity of the place amidst the constant chirping of crickets. On our way back we halted at the temple of Hanuman ji – Hanumangarhi Temple. 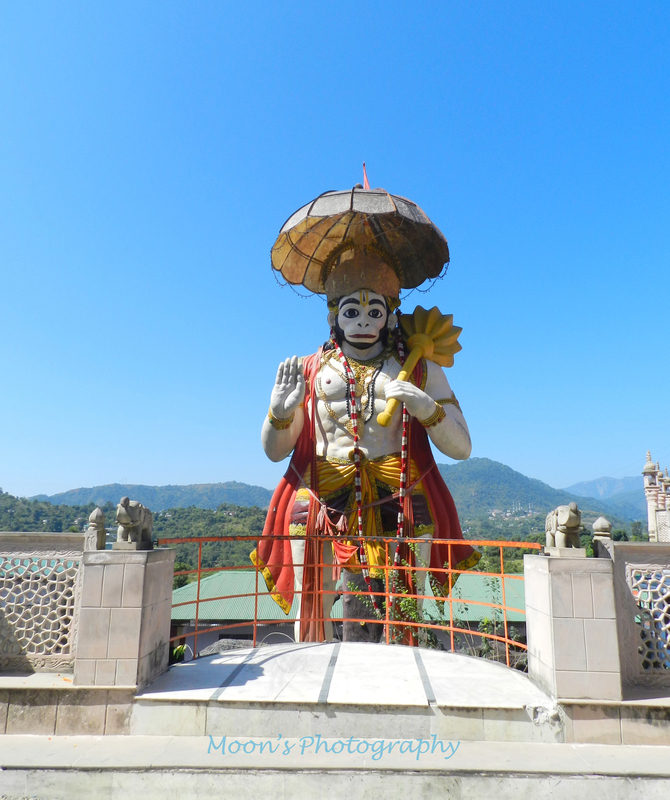 The huge statue of the ape god standing like the guardian of the hills inspires awe and admiration. Your Nainital sightseeing is not complete if you don’t visit the Waterfall; take a bird’s eye view of Khurpatal and watch the sunset from the sunset point there. We rented a small car for Rs 500 that will take us to the waterfall and return to the mall from where we started. The waterfall is about 15-20 minutes drive from the town center. It was nice sitting by the waterfall under the towering pines and listen to the sound of rippling stream. On our way back we were to see Khurpatal and sunset point. 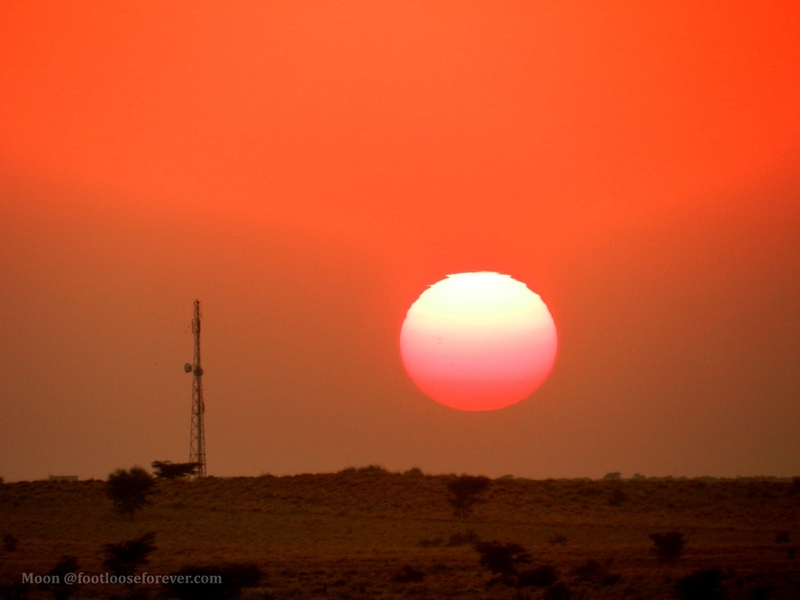 “It’s almost impossible to watch a sunset and not DREAM” – I read this quote somewhere. 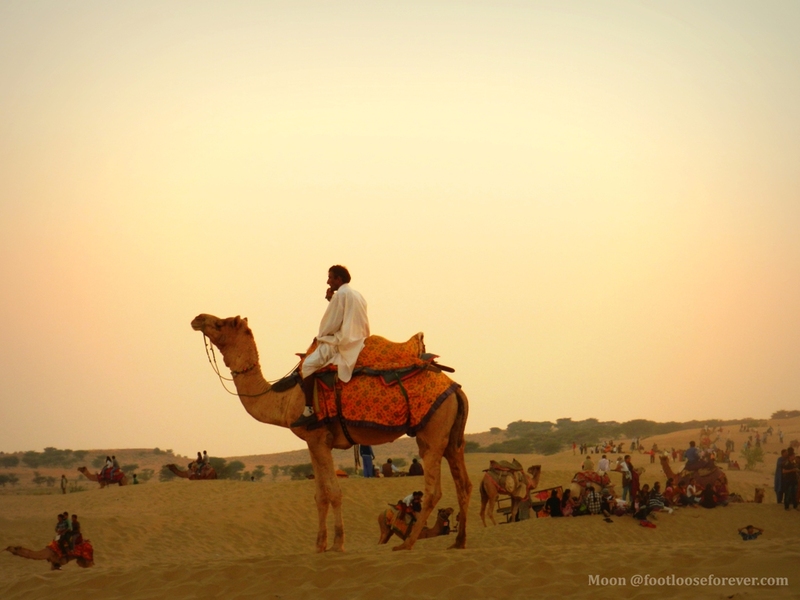 When we were watching the sunset at Khurpatal these lines occurred to my mind … so true! Nainital Zoo, official name Pt. Govind Ballabh Pant Zoo, is one of India’s few high-altitude zoos. 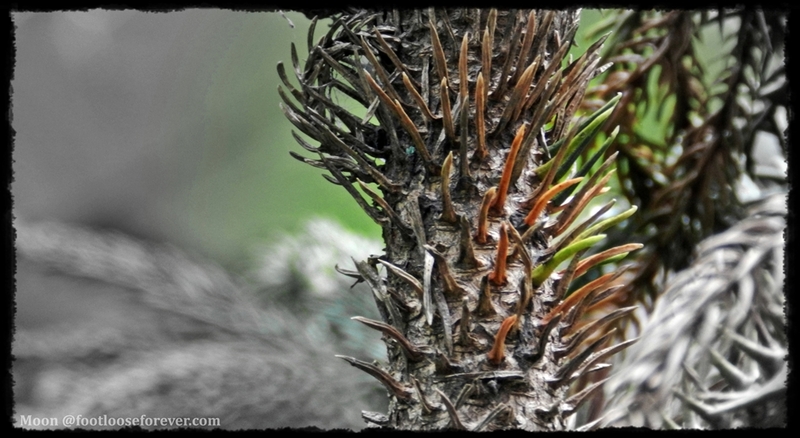 Here you will get a hint of Kumaon’s rich flora and fauna. Be prepared for a face-to-face meeting with some of Himalaya’s rare animal species such as snow leopard and black bear. In addition, there is leopard, Siberian tiger, wolf and wide variety of birds. Even if you are travelling on a budget, shopping is UNAVOIDABLE. To me, shopping is a part of travelling, especially in a place like Nainital where you’ll find so many things worth buying. 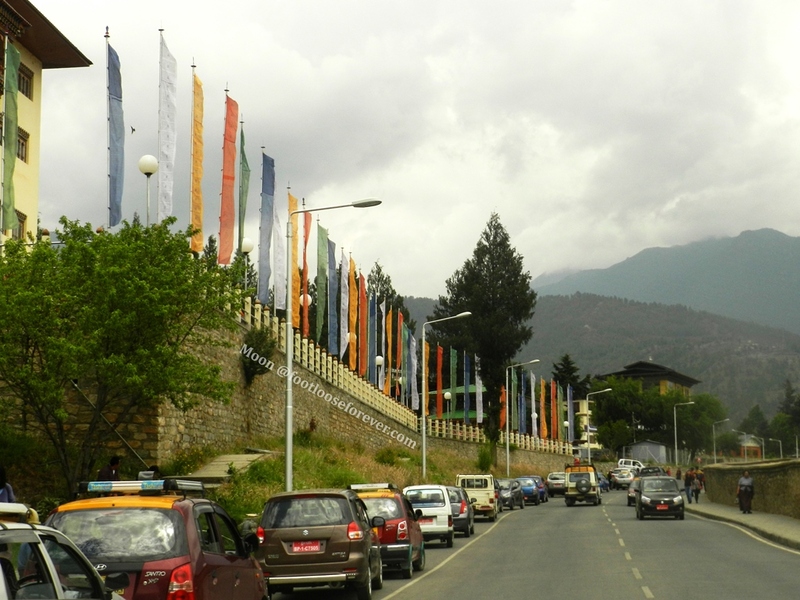 The mall road is lined with stores offering woolens, candles, woodcrafts and ornaments. There were trendy woolen caps, scarves, stoles, ponchos, cardigans and jackets for kids, women and men. Price for women’s caps range from Rs 100 to 500 depending on the knit quality and design of the items. However, I could not resist buying a few sets of woolen cap and neck-scarf for my sister and me. Well… how do you like my new accessories? The Mall Road leads to the main chowk (‘market’ in vernacular term), flanked by a Gurdwara and Nayna Devi Temple at one side and a Mosque and a Church on the other. 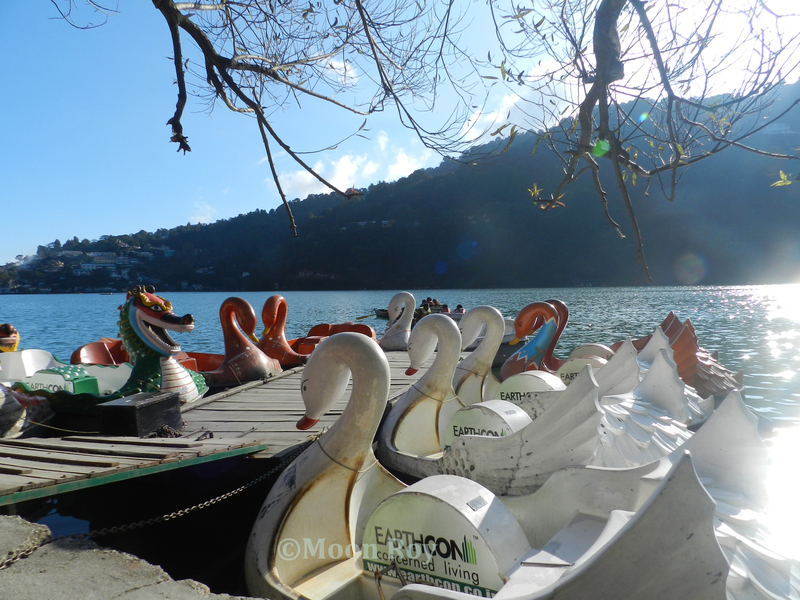 The chowk is the recreational center of Nainital town. There were Tibetan and Cashmere stores as well in the main market. Nainital is also famous for candles. You’ll find a variety of candles at the stores. In fact, candle making is an art here. Diwali was round the corner and I bought some colorful pieces of candles as a souvenir to take back home. After shopping we had some snacks (Aloo Tikki) and a cup of hot chocolate from a street-side eatery. There is no dearth of food outlets in Nainital – from full-service multi-cuisine restaurants to small street-side food stalls there is something for every budget. 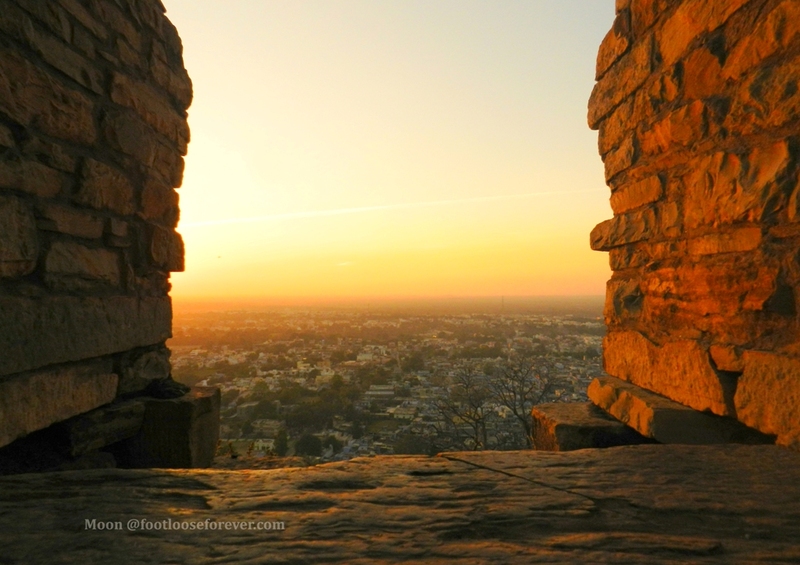 You’ll get a list of eateries in Nainital here. If you want to relish a cup of coffee in the afternoon while enjoying the view of Naini Lake Café Coffee Day on the Mall Road would be the right place for you. Just like every good thing has an end, our Nainital exploration came to an end and we left for Kausani the next morning. 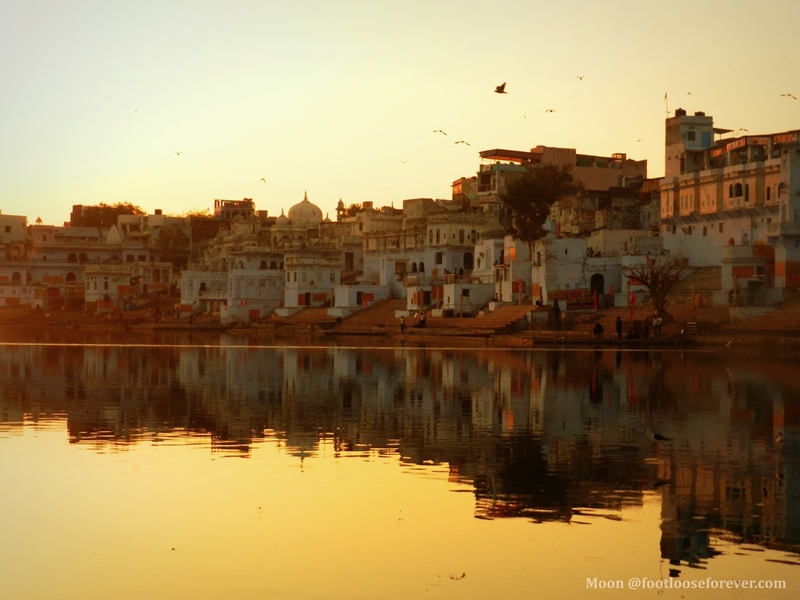 But deep inside my heart I felt an urge to coming back in the city of lakes someday.